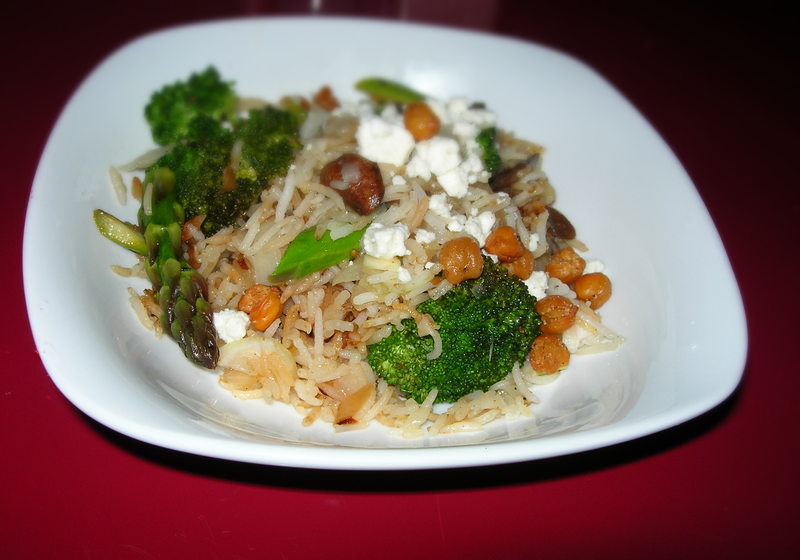 This is a 10 minute dish that is fresh, flavorful and delicious. Put some water in a kettle to boil and add a dash of salt. In a skillet, heat 2 TBSP of olive oil at medium low (3 on a 10 point electric range). Mince two cloves of garlic and toss in to cook. Clean and slice 4 mushrooms and let cook. By now the water should be boiling, add 1/2 cup of dry egg noodles. 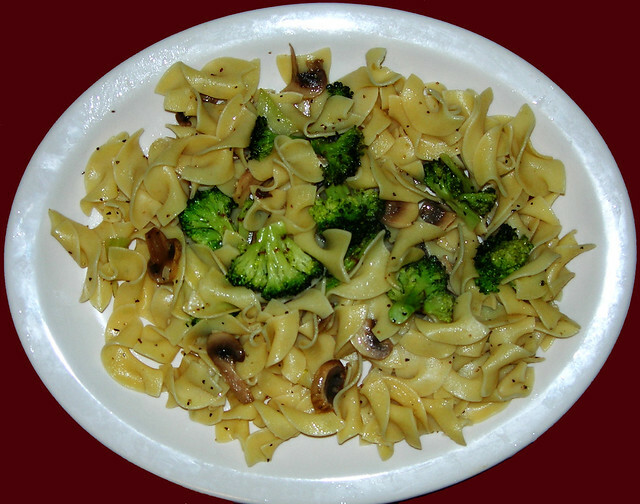 Take one stalk of broccoli and cut off the florets. 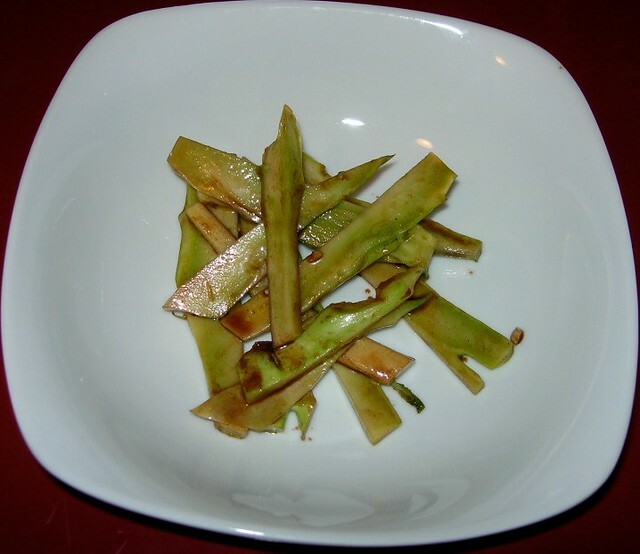 You can peel the stalk and chop it in smaller pieces or save it for pickled stems. I reserved the stem to pickle later and only used the florets. Put them in a small bowl and heat in the microwave for 3 minutes. The mushrooms and onions should be nice and tender. Cut a lemon in half and squeeze all the juice into the skillet mixing it with the olive oil and mushrooms. Taste and add salt and pepper to taste. Toss in the florets. The noodles should be done, drain and stir them in, tossing lightly to spread the lemony, garlicky olive oil through the dish. 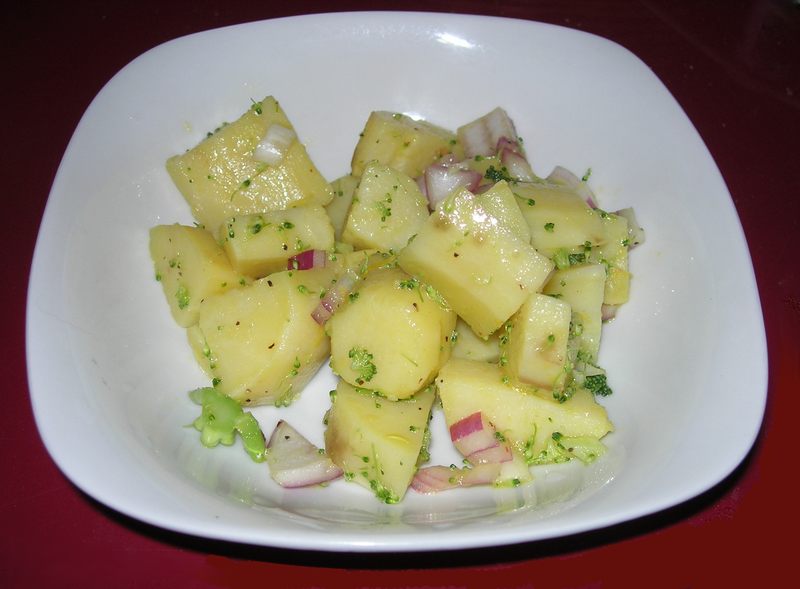 This makes one complete meal or two servings as a side dish. The lemony garlic flavor is fresh and bright and gives this a lively zest. With today’s food prices, there’s no reason to waste anything. When I cut off the florets for broccoli salads and was left with the stems, I decided to make pickled broccoli stems. I make a variation on this recipe by Martha Rose Shulman for The New York Times. I trimmed and peeled the broccoli when I removed the florets. I cut the stems into 1/4 wide rectangular sticks and put them in a bowl, sprinkled about 1 TSP of kosher salt on them and put the cover on it and shook it to distribute the salt evenly. I stuck it in the fridge and left it there until the next day. I drained the water off and added 2 cloves of chopped garlic, 1 TBSP of balsamic vinegar and 1 TBSP of olive oil. I almost always use a much higher vinegar to oil ratio than dressing recipes call for. I also up the garlic because I really like that bite. I covered it up again and left it in the fridge overnight. Now it is rich with garlicky flavor accented by the lovely rich flavor of balsamic. It’s incredibly flavorful and aromatic, making it a delightful, satisfying snack. The salad in a mixing bowl before serving. My best friend dropped over this morning and stayed for lunch, so I wanted to make something that did not take a lot of effort. I had trimmed broccoli florets off the heads last night when I made the Charred Tomato Broccoli Salad and had a little less than 2 cups left. I brought water to a boil and cooked the florets for 3 minutes until just tender and then cooled them in cold, running water for a couple minutes. Meanwhile I cut up a grapefruit. I happened to have a white grapefruit so the flesh is lighter than you usually see, but I think any grapefruit will do. I trimmed away all the pith and skin and cut the segments in half and tossed it all in a bowl with the grapefruit. I diced up two fresh shallots and added them as well. Then I chopped up one sweet & sour pickled pimento and mixed it in. After stirring everything together, I added a dash of cayenne, a splash of balsamic vinegar, about 1 tsbp of walnut oil and a bit of salt and pepper to taste. It was delicious. This made 3 servings. The flavors were bright and fresh with a lovely blend of sweet, sour, sharp and hearty with a bit of heat. We had a couple pieces of breaded chicken tenderloin on the side and loved the taste of the dressing on the chicken. Even better, there was some left over and after marinating together for a few hours, the flavor was even richer and more multi-dimensional. I served this salad two ways, with and without the chicken breast. I had it without the chicken as a side dish for my Stuffed Portobello Mushrooms and then ate the other half for dinner with a braised chicken breast cut up and added to it. Both ways were delicious. First I put my cast iron skillet on the stove and heated it to medium high. While it heated, I cut a large heirloom tomato (it happened to be about half yellow and half red) in half and gave it a soft squeeze to get some of the wateriest tomato juice out. I rubbed a bit of olive oil on all sides and put the two pieces of tomato cut side down into the skillet and let it cook until it charred before turning it over and charring it on the other side. Meanwhile, I took a stalk of broccoli and trimmed the stem away, leaving about 2 cups of broccoli florets. 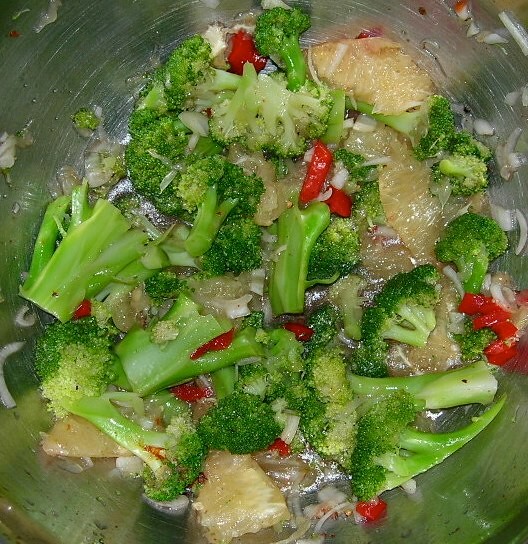 I heated water to a boil with a tsp of salt and added the broccoli cooking about 3 to 4 minutes until just tender. I removed from heat and cooled. After removing the tomatoes from the skillet, I added the juice of one lemon and 1/4 cup of vinegar to the skillet and deglazed the skillet, adding a bit of salt and pepper. Removing from the heat, I added 2 chopped scallions and 1 clove of minced garlic. This is the vinaigrette, using the oil and tomato char from cooking to add a bit of smokey flavor. I chopped up the cooked tomato, added it to the cooked broccoli and dressed with the tomato vinaigrette and let cool in the fridge while the flavors married. This made a tasty side salad. This made enough for two salads. The first was a delicious vegan salad and the second a salad entree. For dinner I wanted to add some protein, so I braised a chicken breast and cut it up and tossed it in with the salad. First off, this is not a Cream of Broccoli Soup. As a diabetic, I am not going to make cream soups when there are such delicious options without cream. I will make chowders using mashed cauliflower or potatoes to give the thickness and creaminess of a chowder without the cream. This soup, however, doesn’t mimic cream soups at all, but is a simple, yet delicious broth-based soup. The first thing I did was stew a whole chicken last night. I sauteed one chopped onion, three cloves of garlic and a tablespoon of oregano with some olive oil. While they sauteed, I washed the chicken and removed the giblets etc that were stuffed inside. When the onions were transparent, I added the chicken and the giblets and covered with water. I tossed 2 bay leaves on top and let simmer for about two hours until the broth had a rich, chicken flavor and the meat fell off the bones. I removed the meat and set it in a colander on top of the stock pot so the broth drained back into the pot. Refrigerating overnight, the meat was cold and easy to work with as I removed all the skin, cartilage and bones. This left me with about 4 quarts of broth and 12 cups of chicken meat that I stored in airtight refrigerator containers. I put 1 quart of broth and 2 cups of chicken in a medium sized sauce pan. The broth was not as deep in flavor as I like so I added 1 tsp of Better Than Bouillon Chicken Base. While the broth and chicken heated, I chopped up 2 broccoli spears and 1 tomato. I added them to the broth when it began to simmer and let them simmer for about 15 minutes – until tender and then added 2 tablespoons of Dijon Mustard. 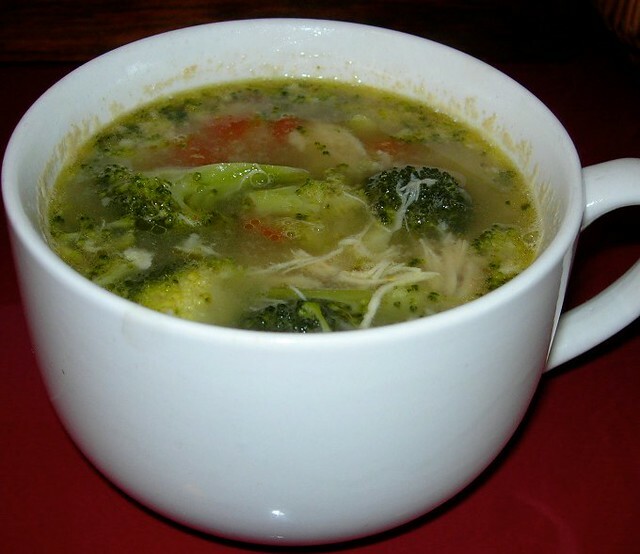 The soup has a rich chicken flavor with a great foundation from the onion, garlic, oregano and bay leaf. 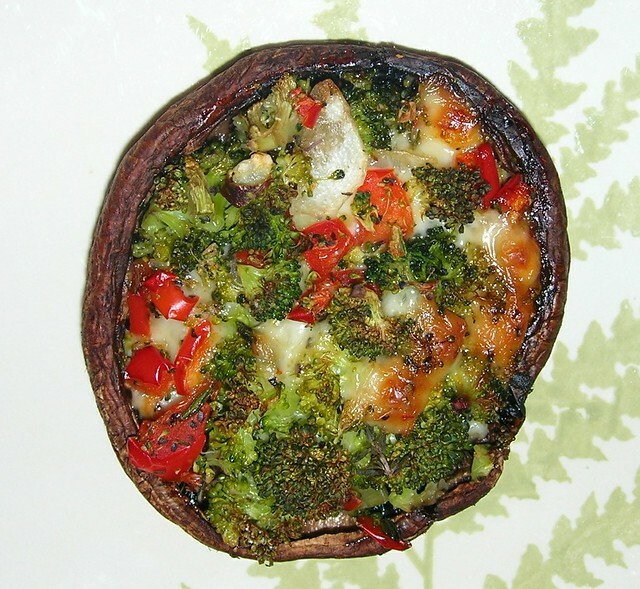 The broccoli is perfectly tender without being the least bit mushy and the tomato adds some nice color. The Dijon Mustard top note, though, really makes this a fabulously, flavorful soup and unlike a cream soup, this is nice, light summer fare. 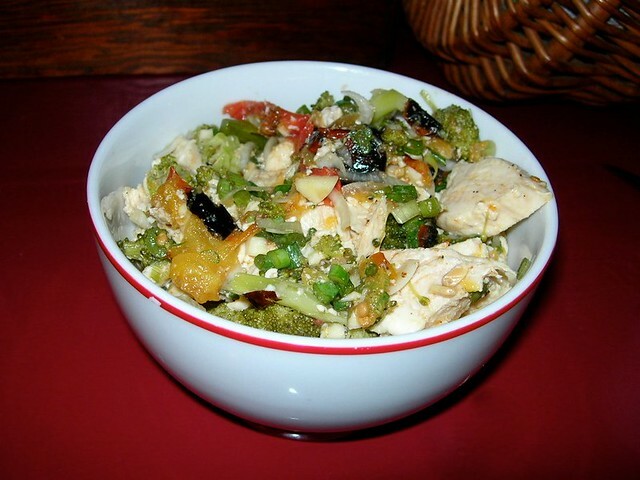 This makes about 6 servings – and of course, there is chicken and broth enough for another soup and several salads or sandwiches. This is a quick and easy lunch that’s very tasty. Take two slices of bacon and slice into one inch pieces. Heat skillet to medium, toss in the bacon slice along with about 2 TBSP of diced onion and some salt and pepper. Let that cook until the onions turn soft. Meanwhile, take two stalks of broccoli and peel the stems. Cut off the florets and slice the stem into 1/4 inch coins. If you peel the stem, it is more tender and does not have a bitter taste. Toss them into the pan with the bacon, add some salt and pepper and put a lid on it, lowering the temp to a low-medium. In five minutes, take the lid off, test for doneness, stir and if necessary, cover and cook a few minutes more. 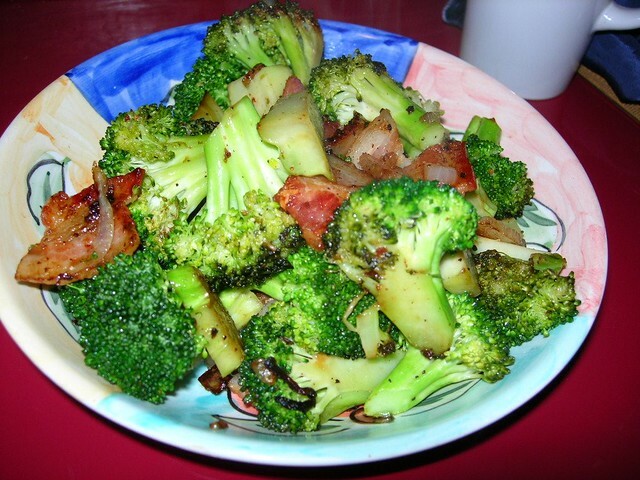 When the broccoli is tender, add the juice from one fresh-squeezed lemon which will offset the bacon fat beautifully. Serve. It has a lovely, fresh flavor and the mix of bacon and lemon is always delicious.